Today, August 14th, is the three year anniversary of the day I received the phone call from my neurologist directing me to the hospital, because he’d seen a glioma on my MRI scan. And as of today, we have a new plan. Awake craniotomy in September. (Updated to add – date will be September 9, 2015, kickoff at 8 am CST). On August 14 three years ago, my neurologist phoned me on my cell phone and told me to go to the Emergency Room. Since then, a number of people have commented to me that they find it surprising I was informed that way. I didn’t think of it at the time, but in retrospect, I actually prefer that to having to wait for a follow up appointment, wonder what they’d seen on the scan, etc. And it turns out he had ulterior motives. He wanted to get me on with a very specific neurosurgeon, who happened to be on call that day, so he knew I’d get in with the surgeon fastest if I went to Emergency. And I’m pretty glad he chose to do that. Over the past three years, my surgeon has taken a cautious approach, recommending watchful waiting to see whether my tumour would grow, and watching for new symptoms. When my last monitoring scan in May showed growth, and I’d started having a few minor new symptoms (disruption in handwriting, clumsiness in my right foot going down stairs – but not up?? ), he said “I think it’s time to do surgery, and we’ll do it with all the bells and whistles at our disposal”. I like that plan. It turns out that at the University hospital here in Saskatchewan, we have access to a terrific functional MRI research program. Although it took six weeks to get the scan, it was worth it. I saw the results with my surgeon yesterday. It’s absolutely amazing to see pictures of what areas of your brain are activated when they ask you to perform simple tasks, to see small regions light up so distinctly. It really made me think about the wonder of how we all work, and that we can image it like that. My fMRI scans showed that my language and reading functions, which were one area of concern, because my tumour is in my left cortex where those functions are usually located, mapped well away from the lesion. We knew sensory and motor tasks would be key, because the tumour is in the parietal lobe, just alongside (posterior to) the sensory motor cortex. Minor motor seizures are what first took me into the neurologist, in fact. The fMRI data showed that these functions map right up to the tumour, so my neurosurgeon is recommending awake craniotomy. In this type of surgery, the patient is awake during the procedure, and can respond to questions or tasks set out by the surgical team, to make sure that the surgeon can remove as much tumour tissue as possible without disrupting critical “eloquent” functions such as motor abilities or speech. This sounds sort of ghoulish, no? 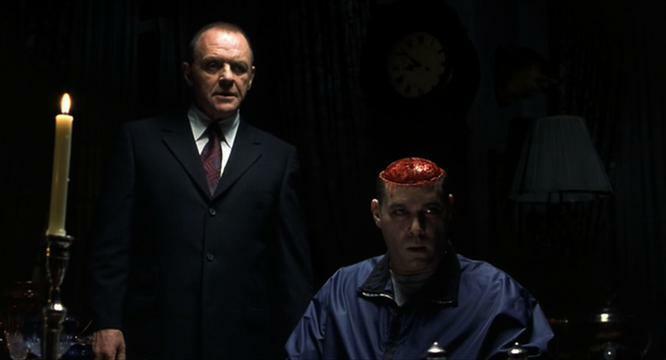 I always picture that scene in Hannibal when Ray Liotta is having dinner with the inimitable Anthony Hopkins as Hannibal Lecter. Who wouldn’t? You can’t unsee that! Practically speaking, this approach offers the best chance of getting as much tumour out as possible, reduces risk of post-operative complications and losses of function, and has been shown in studies (1, 2) to help the patient feel more like a part of the team, with an active role in making sure the procedure goes well, and more in control of outcomes. I feel like I’ve spent the last three years preparing, with the knowledge that I’d be here eventually. And I’m ready. I know I’ve done everything I can to get my body healthy, to focus on present and mindfulness, and to come to terms mentally with where my life is. And I will admit that I’ve always harboured a quiet desire to shave my head. What can I say, I’m a child of the Sinead era. You are absolute inspiration! Thank you for being so open about all that you’re going through. With all the work you’ve done over the years with self-care (via ketogenic diet, etc. ), I am sure you will come out of this intact, doing better than most. As my husband (who has cancer) and I journey through our way trying to optimize his body and mind, it’s been genuinely refreshing to read your blog, as well as your updates on Facebook. Thanks for all you do, and know you have a village of people who are rooting for you every step of the way. Thank you so much, I hope your husband is doing well, I know how dedicated you’ve been to learning your way through what you’re dealing with too. Thanks for your support, for being a reader, and participating in my group too! Best to you. You sound objective, almost outside of the events. I’m guessing it’s just how you write. Well, I know how you write-I’ve been reading your posts for most of this year. I’m an RN and this whole procedure reallly does sound like a good one. I know you’ll do great. You’re attitude is so good. I’ll be with you and waiting to hear how very well you are after the procedure! Haha, thanks for reading so loyally! I am a bit analytical by nature, and I think it’s also how I cope. If I can understand the process and procedures, they become more interesting and less scary. I like to practice being an observer of my situation sometimes. I find it evens out the emotional highs and lows! Best wishes to you for your upcoming surgery from a fellow brain tumour patient living in London. I too have an upcoming awake crainiotomy due to recent progression in my tumour. I was awake last time too and can remember the whole thing. It’s not as scary as you may think! I hope you make a speedy recovery. Keep up the blogging! Thanks, it’s great to hear from others who’ve undergone the procedure; thanks for reading. I had an awake craniotomy in August 2010 and I remember nothing of it. I was definitely present though, the surgeon told me all these facts about my business that we had discussed that I never told anyone! I wish you the very best in your upcoming educational experience! At least this journey has been one for me (education, that is). May you come out of it with even more determination to LIVE! while you are alive. Alix, you really are an inspiration and a role model of someone who displays acceptance of the present moment, compassion, courage and love. We are all learning from you. Thank you for being so open and sharing your journey with us. Thank you for your humour, too. I love that scene from ‘Hannibal’ ! Look forward to our next connection. Go get ’em tiger. Thanks so much Shelly. I think I posted somewhere, maybe in Facebook, I’m not sure if you saw it, how my yoga and meditation made me a star fMRI subject. One task was to “engage your abs”. They were explaining not to move or sit up, but just tense your muscles and I said “I teach yoga, I know how to engage my core”. The researcher said “Oh, great, I guess I don’t have to explain the next thing about how measuring baseline depends on your ability to think of nothing but your breath…”. Good luck. Thank you for your inspiring post. Thanks for this Alix. I remember seeing an video of a guy getting fully-awake open-head surgery. He had to play the guitar throughout to make sure that he did not lose function. Pretty good, although I am sure that his surgeon is happy he was not a tuba or a pipe-organ player. Thanks Dennis, yes, I saw that too! I’m wondering if they can make me sing on key while they’re in there? Great luck with the craniotomy. I stumbled on your year one – but I’m selfishly looking at Keto for weight loss and wanted to see how others were doing, in similar situations, or vastly different. Your writing is open and engaging and drew me in so I had to read more and I’ve enjoyed the journey. I wish you well and look forward to reading more posts in the future. I very much admire your mental strength and toughness. Wishing you all the very best of outcomes for your upcoming operation, together with a smooth and quick recovery. Hope you had a successful surgery – waiting to hear good news! Good luck to you! I found information about you in an online newspaper from some time ago. It looked like you were eating quite a lot of vegetables. Have you considered going zero-carb? If low-carb is good, zero-carb has got to be better, and I have seen a story of a guy who has cured his brain tumor with a zero-carb diet. There is plenty of evidence that we don’t need any vegetables, and I do believe that you may achieve better results removing carbs completely. You got a new fan! SO glad i found your blog, I was thinking of doing the same thing and now i might just! Im in a very similar situation you were in 3 years ago!